The next clue is posted on the Hub page, thanks to Amy Lynn for telling us about it in the comments. This is what the image looks like on a white background. This ABC TV show logo was found by Cypher80b and in my view shows a definitive link between the clue and the Crumbs bakery. Sayid'sGirl has let us know that there is a new clue, it is a picture of 13 circles - which Zepeleptic has told us is a Bakers Dozen, further confirming the connection with the Crumbs bakery. http://larchmontdailyphoto.blogspot.com This blog has a post about part of the Metropolitan Museum of Art having a stone facade that used to be on Wall Street. and was last night the site of another dinner party. and was part of a Branch Bank of the United States (1822)"
LARCHMONT: PGArtventure Gallery will exhibit "Blueprint - spaces between spaces," works by Merav Ezer and Adi Shniderman from Sept. 9 to Sept. 23. Don't know what this has to do with Wall Street. Your link doesn't work, Zort. What do you think of the image Maven ? It looks like something crumbling away to me. Well, Wall Street facade in Larchmont museum seems like you've found it! Yeah, but then what does the Larchmont part of the clue have to do with it? It's not a Larchmont museum, just that the person on the blog is from Larchmont. The Metropolitan Museum of Art is on 5th Avenue in NY. Are the letters made of sand? But is there a crumbling Wall St. facade in California? I saw that too, but I don't see a Wall Street connection yet. It is quite close, but not close enough to be linked. 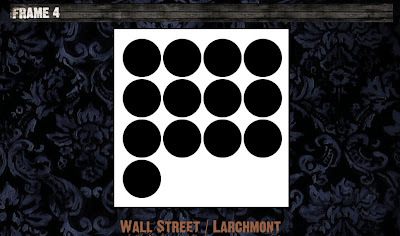 Perhaps Wall Street and Larchmont just give us a clue to the city ? Yeah, 11th St. is not close to Wall St. in terms of NYC geography. I saw that hotel, too, but it wasn't anywhere near Wall Street. There is also a Health Club firm called Town Sports International with clubs in both locations. gkpipes: Like the idea of "crumbs" as in bakery. I see their store on Larchmont in L.A., but there's no Wall Street nearby. Maybe the "crumbs" are showing that it's just a facade...that would tie in with the Wall Street facade at the Museum. man, I checked the site earlier and nothin'....glad they updated again, thought we'd have to wait until Tuesday for it. I'm off to the cinema now to see District 9. I think the Crumbs lead is the best so far. Maybe something will happen at both locations. Good job all...until the next clue! I'm ready to see the next poster. Maybe that Crumbs Bakery will have the poster info at both their Wall St., NY and Larchmont, LA stores for both coasts! hahaha, Scoutpost...we think alike, roomie! Google that address for a map. Crumbs Wall Street is located at 87 Beaver Street between Hanover Street and Wall Street. I wonder if it is a dual coast event if they'll time it together... or the NY ppl will get it first. every time I go out somewhere you all find something new !! Stop that ! Ok, I'm here now, did you miss me ?? LOL. Assuming we don't have a date yet, I'll walk down there on Tues (it's right by my office) and see what's up. Someone has emailed us at the admins address to say he was the first to order the Van poster, and he got a Polar Bear print as well. Hopefully we will get some photo's soon. I seen the clue before I went out. So we're thinking it may be a bakery then. So we were teased with cupcakes and got t-shirt and skateboards. Now we might actually get cupcakes? Cypher80b Thanks for posting that here as well. You are right it looks like you have found the definitive link between the clue and the bakery. I remember that show. Jane Curtin and William Devane were hilarous in it. But they weren't enough to carry the show. It was canceled. BTW I wasn't going to admit it but all those deletions were me. I guess it was 3 more times. I know exactly where that is, I used to work near ther, any NJ people- just take the PATH to WTC, walk up Broadway and hook a left on Wall it's only a couple of blocks. What day is it, I'll go. There's a new clue at DC&PB. I've updated the main post with the new information. Hope they make special LOST cupcakes! I went down to the Crumbs on Larchmont and asked about the game. The Counter guy thought I was on crack, or a geek, or both! However, the manager knew vaguely that something was going on. She didn't knew when, but knew it had something to do with "jumpsuits"
To my geeky surprise, I was the first person they said that had come into the shop asking questions. Way to go Anon! So we know the where, just need to know the when. Wonder if they will give out jumpsuits to the people who show up, or to the 1st person to order the new print? Maybe the new print will center around the Dharma jumpsuits? In any case...this clue is triggering a major sweet tooth! Hi all. Longtime lurker. Love the blog. I just got my beautiful Locke poster in the mail. I have a question for those of you who have received posters. What name was on your return address? Mine said 'Tyson Givens'. This seems like a very weird 1988 reference to me. (Mike Tyson and Robin Givens were married in 1988) Is this an unfortunate person's real name? Or a very creepy fake name choice? Jumpsuits? Hope that means Dharma-wear! Anon...if it's near you, I'll leave it in your capable hands. Larchmont Village is quite a ways from me when traffic is involved...which is always! I guess there's a possibility that the 13 circles may ALSO refer to the 13th of the month, but Crumbs in NYC is not open that day... maybe they're having a special event. Hi. I'm the one that received the letter with the print for the Van print. Congrats TomRex and Thanks for sending pics. I've been wondering the same thing. There's no way this person's name is actually Tyson Givens. I'm putting my mangos where my mouth is on it being a reference to Tyson's marriage. TomRex, looking forward to photo of your letter and DCaaPB print. We have notice odd errors in grammar and spelling in communications from A. Miller. 'watch television' was in the last letter. 'icing on the cake' in your. I think we're seeing a pattern. zort70, did you ever get a photocopy of link to first letter? Yeah LotteryTicket... I think it's pretty cool that TPTB are putting this much trust in the fan community in assuming that a good portion of these letters will end up getting photographed and shared. They really know us. They've studied us. TPTB are doing a great job placing these clues and keeping us fans happy! They are really paying a tribute to the LOST fandom. Placing clues in the letters...which seems to relate to the next poster...just shows that they know you guys scrutinize every little thing! I'm very impressed. Indeed Maven. They could have just sold the prints and left it at that but they went all out and made it something that we can still obsess about and speculate on... even without it being a proper "arg." ... and the live-event format of releasing some of the print websites brings back the vibe of some of the apollo bar events they did during the first arg. captainaeon - Welcome along to the blog. I think there has been some speculation before about the link between the 1988 Gallery that is coordinating this and the Tyson Givens name. I've just put an announcement about the D23 event on the blog. Not strictly aRG related, but you never know there might be something. Is anyone going to go on Saturday and try and get their poster signed ! Jonesy over on the DarkUfo forums has just said that this is like a Hybryid ARG (HARG) because of the different phases. Apparently the new Lost Mysteries of The Universe episode is available via Hulu to US residents only, can anyone access it ? yeah I watched it this morning. It's a day early since it was going to come out on the 8th. It wasn't as interesting this time. Did that link work for you Zort? This one's really getting to the DHARMA nittygritty! Can't wait till peeps start picking it apart. Merzmensch, are you still out there? Wiki says about the Ludavico technique mentioned: "The Ludovico technique is a fictional drug-assisted aversion therapy from the novel and film A Clockwork Orange." All in all, this film gets back to our TLE DHARMA roots, which is to say, being globally ubiquitous, devious, and spooky. Very juicy stuff since in the show we hear that we're pretty much done with DHARMA backstory, so this is neat. Church in LA. The Lampost? There was a WAKY invoice. No the link didn't work, but I do have another option when I get back home after work. Another WAKY invoice !!!! Let the conspiricy theory ride. I do like that the check is made out to "The Los Angeles Church"
in case anyone was wondering, CRUMBS is closed today on Wall Street. Yeah, I figured. It wouldn't make sense for a business on Wall St. (or Beaver St., actually) to be open when there's no one there to buy. Are you going to be at the event, Woody? Sayidsgirl said: "The Lampost?" Exactly! We're really getting the inside DI info in these little films, I'm so happy. Joyyyyy. Docarzt has put the MOTU video on You Tube so I'm watching it now. I have uploaded pictures of the letter and print I received. NEW POST for the Mysteries of the Universe video. Sorry Tom I'll repost your link in the new thread. Interesting return address to Mr. Reasor re: DCaaPB print. Google maps this address, street view and businesses listed. Could be the Mailbox drop? Wow. That was fast! How'd you get all that from the photo? we have no idea what day this will be yet right? Yeah - no idea of the day, but that cupcake surely looks good. Would they stretch this out until the 13th? Or is it more likely it would be tomorrow? I would think they would have spread the clues out more if we had to wait until the 13th. Hey guys. Not sure if anyone would be into using this or not but I set up a Ning to organize fans planing to attend the live events. Basically people can add the events, say if they are attending, etc. Not sure if anyone will use it or not.... but if you want to or have suggestions feel free. It's meant really as a supplement to any sites following the ARG and took me like 2 minutes to set up. Any thoughts/suggestions are welcome! The idea is that it could be used for future events as well. tomrex, I noticed that you print was assigned 25/30. So where are 1-24 and does this mean that 5 more are likely to be given out? Zort70, somewhere back in the 200 comments re: Van poster, someone noted that the Dharma logo numbers contained an 'extra' bold '5' (part of 15). From photos of the van poster that have been linked here, somewhere, that this is, in fact, true. LT: I do know that #24 was given to the first purchaser of the first print (Hurley). I imagine we will see 5 more. I think the others were sent out to Bloggers and others. Woody, #Hollywood_Bob will be headed to LA store. The background on the announcement is the Dharma cafeteria logo. Another reference to Hurley? Hope there's more to it than that, though.